Will it always be about guilt? 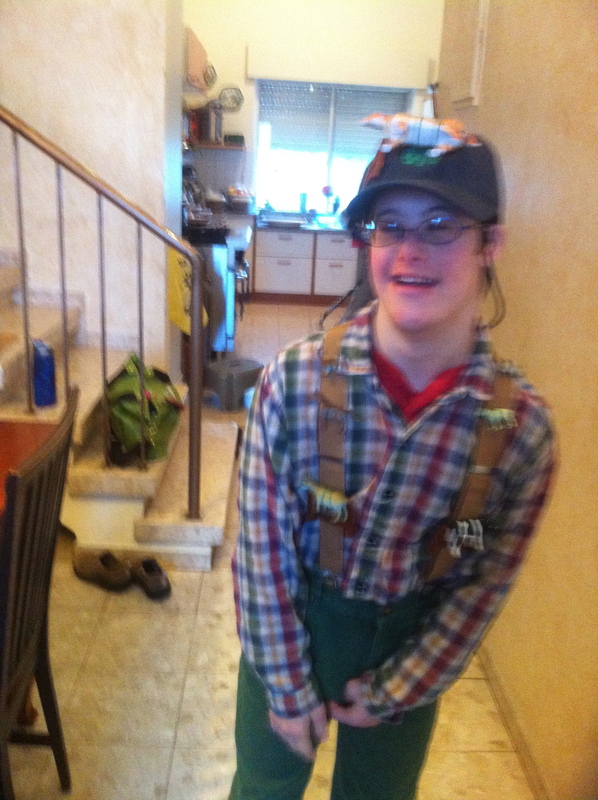 Akiva as Old Macdonald, what the locals call ‘Dod Moshe,’ Purim 2012. Why are you so tired, asked the chiropractor the other day? I hesitated before answering. She’s after all, a single parent, with an energetic and adorable toddler. Surely she’s more tired than I am? Or, maybe she’s not. I looked over at Ira the other morning and told him that I like him, really like him, but he and both laugh that we’re sort of like two ships passing in the night – we look at each other in a friendly fashion but barely have the energy for an in depth chat, let alone a night out together. When my middle son, Gabe, asked me innocently this morning – this as he packed up for a 2-week stint at his mechina program – for some help putting together his breakfast – I snapped at him because I felt tired and cranky, so not his fault. Why, you may ask? Akiva’s been waking up earlier than ever. As it is, the alarm goes off at 6:15AM daily, so that we can get him through his morning routine before being packed off to school at around 7:05AM. If Akiva only slept until 6:15, I’d be happy I guess, but lately he tends to wake up at 5:30AM, sometimes even a tad earlier than that – bright eye and bushy tailed and very often, wet. Really wet. Shower and change the sheets and put in the laundry wet. Even if we get back into bed for a few minutes, we do so with Akiva between the two of us, happily nattering on about whatever’s on his mind. Not exactly restful, right? Put him to bed earlier, you say. Doesn’t work. Put the blinds down tight and dark. Been there, done that. Even though he’s biologically almost 15, he remains an early riser and given that he’s often asleep by 9PM, he’s getting a nice amount of rest. He is. Not us. When I called the National Insurance Institute a few years ago to inquire about assistance with full-time help at home, they told me there’s no further help – other than our monthly stipend that we receive which absolutely helps with essentials such as diapers and babysitting – until the young person is 18 years old, except for children with more significant physical issues, I believe. That’s frustrating for a family coping with the demands of raising a developmentally delayed teenager – essentially a child in a young man’s body. I’m not the 35 year old I was when he was born – can’t pick him up, can’t move him around as easily, can’t physically do what I used to do when he was smaller – and my two older boys are closer and closer to leaving the house. Where does that leave a couple facing an empty nest with an overgrown, albeit loveable, developmentally delayed 15 year old? I’m not sure. I’ve asked parents whom I know, whose children went and lived out of the home in their teens, why they made the choices they did. In each situation, after much thought, it was the right thing to do – for the family, for the sibs, and interestingly enough, for the teen with special needs, who blossomed in certain ways when away from parents who love but often baby because that’s just the way it is. As parents, we don’t baby on purpose but we enable for sure – every day. I’ve spoken with parents who’ve found the wherewithal to hire live-in-help – all are delighted with the results and feel that the right person makes a huge change in the family’s life. That sounds good to us – Ira and me – but we worry about finding the money, the right person, where to put them and what it’s like to adjust to someone new in the home. We fully expect and want Akiva to live at home for the foreseeable future and feel it’s best for our family and for Akiva to have him live at home for the foreseeable future – we’re just not sure about our survival. He’ll be fine. But then I feel angry that I, who helped found and run 2 non-for-profits – Shutaf and Theater in the Rough – both dedicated to the good of the community, can’t get the help or understanding of what I need, what we need as a family. Service coordination, family support and yes, I guess more funding to help our family manage. But then I worry that the backlash will be the obvious one – families who have kids with special needs just expect it all to be handed to them on a platter. After all, a kid like Akiva has a diagnosable-in-utero and therefore, preventable disability – he’s just a drain on society, right? Let’s move on from that conversation for the moment and get back to fatigue – emotional and physical. It’s the struggle, the ultimate marathon, the final frontier for us as a family and we’re attempting to maneuver through the land mines with grace and good humor, just as we did when our boys were infants and we were scraping by on scant hours of sleep a night. So if I seem a little distracted of late, give me the benefit of the doubt – we’re doing our best. This entry was posted in Community, Disability, Parenting, Special needs and tagged developmental delay, parental fatigue, respite, sleep issues by Beth Steinberg. Bookmark the permalink. I co-founded and run, Shutaf, inclusion programs for children and teens with special needs. I'm also a writer and internet content developer with a team called The Honey. I direct local community theater with a group called Theater in the Rough, specializing in experiential productions performed out of doors. You got it babe. From one mom to the next.